The Telegram posed five questions to 14 Blaine House hopefuls. Their answers reveal partisan splits, but also defer to the will of the people. AUGUSTA — As the national debate over mass shootings intensifies, candidates hoping to become Maine’s next governor fall largely along ideological lines – with some nuances and non-answers – on several oft-discussed policy responses to gun violence. Most Democratic candidates for governor support measures such as banning assault weapons and larger-capacity ammunition clips or requiring background checks on all private gun sales. Republicans, on the other hand, are more likely to respond that addressing the country’s mental health and societal issues – or improving data used for background checks – would be far more effective than additional gun control measures that will only affect law-abiding gun owners. The Feb. 14 shootings that killed 17 students and teachers at a Parkland, Florida, high school sparked a groundswell of activism among young people that may be having an impact on the national stage. President Trump directed his administration to begin working to ban sales of so-called “bump-stock” devices that can effectively turn a semi-automatic gun into an automatic firearm. More controversially, Trump also suggested he was open to raising the minimum age for a gun purchase from 18 to 21 and called on schools to allow armed teachers. But past school shooting tragedies – most notably the murder of 26 children and teachers at Connecticut’s Sandy Hook Elementary in 2012 – have only exposed the political and ideological gridlock over guns that blocks congressional action. And the largely party-line responses from gubernatorial hopefuls to firearm-related questions suggests that it would be difficult to achieve significant policy shifts on gun control and gun violence at the state level as well. The crowd of 24 gubernatorial hopefuls with “active” campaigns as of Friday includes many long-shot candidates with no political experience or organizational support whose first hurdle will be collecting 2,000 signatures by mid-March to qualify for the ballot. 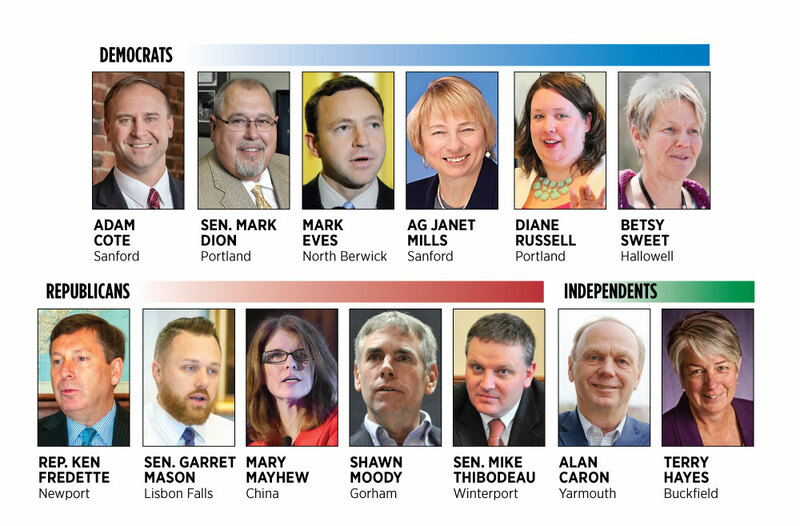 The Maine Sunday Telegram sent more than a dozen of the more prominent, well-funded and experienced candidates for governor – seven Democrats, five Republicans and two independents – a questionnaire seeking answers on five straightforward questions. The responses varied dramatically, from simple “yes” or “no” answers from many candidates to detailed policy proposals from others. Only one of the 14 candidates, Republican Shawn Moody of Gorham, declined to answer any of the questions despite repeated requests and, instead, released a generic statement asserting his support for the Second Amendment while calling for a community resource officer in every school. 1: Would you support an assault weapons ban – with assault weapon being defined as a semi-automatic weapon that has or can be altered to have a clip/magazine with more rounds? All but one of the Democratic candidates surveyed by the Telegram – businessman Adam Cote of Sanford, Sen. Mark Dion of Portland, former House Speaker Mark Eves of North Berwick, former House majority whip Sean Faircloth of Bangor (Faircloth recently dropped out of the race), former Rep. Diane Russell of Portland and lobbyist Betsy Sweet of Hallowell – said they would support a ban on “assault weapons,” as defined. Meanwhile, all four Republicans who responded – Rep. Kenneth Fredette of Newport, former Health and Human Services Commissioner Mary Mayhew of China, Sen. Garrett Mason of Lisbon Falls and Senate President Mike Thibodeau of Winterport – said they would oppose a ban on assault weapons as defined. Most said the issue is with the gun user, not the weapon. But policymakers have struggled to define assault weapons. A 1994 federal ban on some semi-automatic assault weapons prohibited the sale of certain names of guns as well as rifles with certain features, such as a pistol grip or a bayonet mount. But one criticism of the federal ban was it was too easy for manufacturers or consumers to skirt the law with slight alterations to the firearm, and the Republican-controlled Congress allowed the ban to expire in 2004 despite efforts by gun control advocates and law enforcement agencies to renew it. At least seven states – including Connecticut and Massachusetts – ban some variation of assault weapons. 2: Would you support a ban on clips/magazines exceeding 10 rounds in capacity? Again, the four Republicans who responded – Thibodeau, Fredette, Mason and Mayhew – said they would oppose such a restriction. “Focusing on the hardware does not address the underlying mental health and societal issues,” Mayhew said. Most of the Democrats – Cote, Dion, Eves, Faircloth, Russell and Sweet – as well as independent Caron said they would support a ban on larger-capacity clips. “I don’t think there is a (consumer) use for a banana clip,” said Dion, referring to the slightly curved, large-capacity ammunition magazines occasionally used on semi-automatic and automatic rifles. Once again, Mills said she would want to consult with others about the type of ammunition most likely to be used in criminal acts while Hayes again responded “probably” on the clip- or magazine-size issue. Hayes was unwilling to offer firm “yes” or “no” answers on four of the five questions, responding instead that she agreed with statements that the country must have “conversations outside of our ideological bunkers” to find mutual solutions. As it did with assault weapons, the 1994 federal law known as the Violent Crime Control and Law Enforcement Act made it illegal to possess or transfer a “large capacity ammunition feeding device.” That prohibition expired a decade later, however. In the absence of federal law, eight states have passed laws restricting either 10-round or 15-round clips or magazines, depending on the state. The Maine Legislature has repeatedly rejected bills to restrict magazine size, most recently in 2013 when lawmakers rejected a slew of gun-related measures after the Sandy Hook killings. 3: Would you support a ban on so-called “bump-stock” devices? The phrase “bump stock” burst into the public consciousness last October when a gunman perched in a high-rise Las Vegas hotel killed 58 concert-goers and injured hundreds more. The devices, which are currently legal under federal and state law, are attachments to the stock of a rifle that use the recoil action of a gun – hence, “bump stocks” – to allow the shooter to fire rapidly without removing his or her finger from the trigger. As a result, a semi-automatic weapon can fire at nearly the same rate as automatic weapons. Thibodeau said it should be a federal issue, especially since President Trump directed the Justice Department to begin crafting regulations to ban bump stocks following the shootings in Florida, even though the shooter did not appear to be using one of the devices. Thibodeau, Mason and Fredette may get a chance to cast an early vote on the bump-stock issue this week. A South Portland lawmaker has proposed a late-session bill to ban the devices, and the three Republicans all serve on the 10-member Legislative Council that reviews after-deadline bill requests. 4: Do you or would you support L.D. 1761? This bill would lift the ban on firearms on public school property in Maine provided the weapon is unloaded and either locked in a vehicle gun rack or locked case. The law would also require that the owner of the vehicle and the firearm remain in the vehicle during the visit to the school grounds. Current Maine law prohibits firearms on public school grounds with exceptions for law enforcement. The bill’s sponsor, Rep. John Martin, D-Eagle Lake, said the measure was intended to address the “ridiculous” situation in which a parent must park across the street from the school. But dozens of teachers and school leaders testified against the bill during a Jan. 24 public hearing, and the measure has yet to come up for a vote in the Education and Cultural Affairs Committee. Again, the candidates’ answers fell along party lines. All seven Democrats said they opposed lifting the ban on even unloaded guns in vehicles on school grounds, although Cote – a 20-year veteran of the Maine National Guard – said towns should have some flexibility. Cote said he supports keeping the 1,000-foot buffer within the Federal Gun Free School Zone Act as a statewide standard but amending L.D. 1761 to allow towns to adopt even more restrictive policies. Caron, the independent, as well as all five Republican candidates, said they would support allowing drivers to have unloaded, locked guns in their vehicles while dropping off or picking up students. 5: Do you support requiring a NICS (National Criminal Instant Background Check System) check for all gun sales in Maine, including private sales between individuals? This issue is likely familiar to many Mainers, as it was on the November 2016 ballot. Commonly known as NICS, the FBI’s National Criminal Instant Background Check System allows gun sellers to check whether a prospective buyer is prohibited from possessing a firearm. Most NICS checks go through in minutes, although federal law allows up to three days to process the request. In 2017, the FBI conducted 96,590 background checks for Maine sellers, down from 111,582 the year before. Federal law requires a licensed gun dealer to run a background check prior to any sale. But background checks are not required for private sales between individuals, whether the exchange is between two longtime friends or strangers connected with the help of the popular classifieds circular Uncle Henry’s. To critics, that is a loophole allowing convicted felons, domestic abusers and individuals with mental illness to easily acquire guns on the black or private sales market without scrutiny from law enforcement. Nineteen states plus Washington, D.C., require background checks on some or all private sales. But in November 2016, Mainers voted 52 percent to 48 percent to reject a ballot initiative sought by state and national groups to require background checks on all private sales. A key part of Question 3’s undoing at the polls appeared to be a decision by the bill’s authors to require background checks before and after gun loans or transfers between non-relatives. As a result, the costly referendum failed by sizable margins throughout rural Maine amid a backlash from hunters and sportsmen. Both of the independent candidates who were queried, Caron and Hayes, said they supported expanding background checks to all private sales. Most of the Democrats did as well, although with a few caveats. Russell, Sweet, Faircloth and Eves also said they supported running all prospective buyers’ names through NICS, even for private, person-to-person sales. Cote said anyone who wants to buy a gun “needs to show they are not a danger to themselves or others.” But Cote said Question 3 failed because it did not earn the support of rural Maine.